Throughout history, men and women during courtship have paid close attention to each other's beliefs and opinions. The reason for this is clear: the relationship could not possibly endure if there were serious disagreements about the "right" or "wrong" way to do things. Reaching the ideal form of companionship necessitates establishing a foundation of interlocking attributes upon which to build a marriage. Yet certain issues remain, such as how much should one press for similarity in viewpoint, how differences in outlook should be handled, and what level of difference should be considered too extreme. Equal but Different, by Paul Dennis Sporer, is an exceptional book that provides an original perspective on how we might comprehend a person's true nature through the interpretation of traits. Using analyses of historical events, census statistics, opinion polls, surveys, and studies, Sporer examines the devices that people use to cognize, match, and adjust patterns of opinions and attitudes. The book investigates changes in interpretative concepts about personality attributes, where the traditional ideal of love has not been rejected, but instead has been "put on hold". A new, defective ideal has taken its place, one that incorporates self-centered motivations. Sporer finds that in the present generation, many men and women strongly prefer that the range of traits be "compressed" into simplistic conformity. Although perceptions of "difference" are to an extent derived from familial and cultural factors, prejudices can stand in the way of seeing how variations in personality can actually strengthen a relationship. 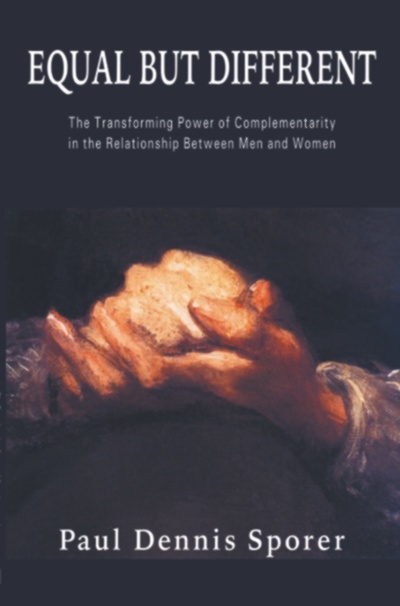 Equal but Different gives us an enlightened new perspective on the inner meaning and value of personality traits, and how such attributes affect relations between the sexes. Although similarities in viewpoint and background can be strongly attractive from the beginning of a relationship, dissimilarities can open up rewarding new vistas that benefit both the man and woman. Paul Dennis Sporer is the author of several books, including Dimensions of Companionship; Liberating Love; and The Concept of Family. He has also edited more than 30 culturally and historically significant books, including Painting Explained, by Thomas Gullick; Is Secession Treason?, by Albert Bledsoe; The French at Home, by Albert Rhodes; Newer Ideals of Peace, by Jane Addams; Views of Old Europe, by Bayard Taylor; The New Birth, by Austin Phelps; The Missionary, by Samuel Mazzuchelli; and Born Three Times, by Thomas L. Johnson.